Note: This story was originally published on March 30, 2015. It has been completely updated for the 2016 Major League Baseball season. When Major League Baseball gets underway next week, don’t limit your enjoyment to watching the game in person or on your living-room big screen. These days, apps running on a second screen—a smartphone or tablet—are becoming as integral to watching the game as cold beer and peanuts. A second screen enhances your experience in ways that just aren’t possible any other way, delivering everything from analysis, player stats, and interactive features to tools for communicating with other fans watching the game. 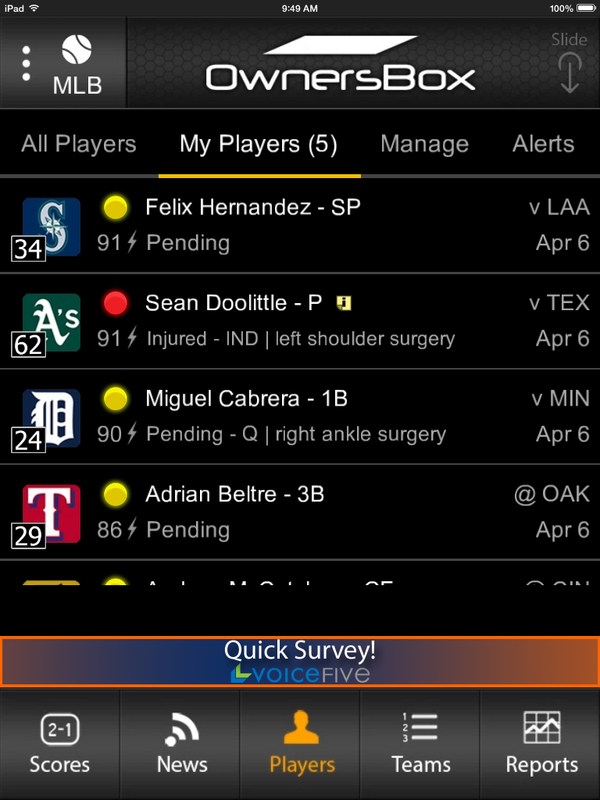 If you don’t use anything else this season, be sure to install at least the free “Lite” version of MLB at Bat. As second-screen apps go, Major League Baseball’s nine-year-old At Bat is still the ace of the rotation. Even the free “lite” version has enough features to make any seamhead giddy, including breaking news, player stats, scores, standings, schedules, interactive rosters, and the ability to customize your homepage as a hub for your favorite team. You can also receive push notifications to alert you to game starts, lead and score changes, and in-game video highlights. It’s worth ponying up for the premium features ($3 a month/$20 a year, or free for MLB.TV subscribers). You’ll get access to a treasure trove of complete classic games in the video library, real-time box scores with pitch-by-pitch tracking, and each team’s live local radio broadcast for every game from spring training through the World Series. The last is particularly useful when you want to mute national network blowhards and tune in to your hometown broadcast team. 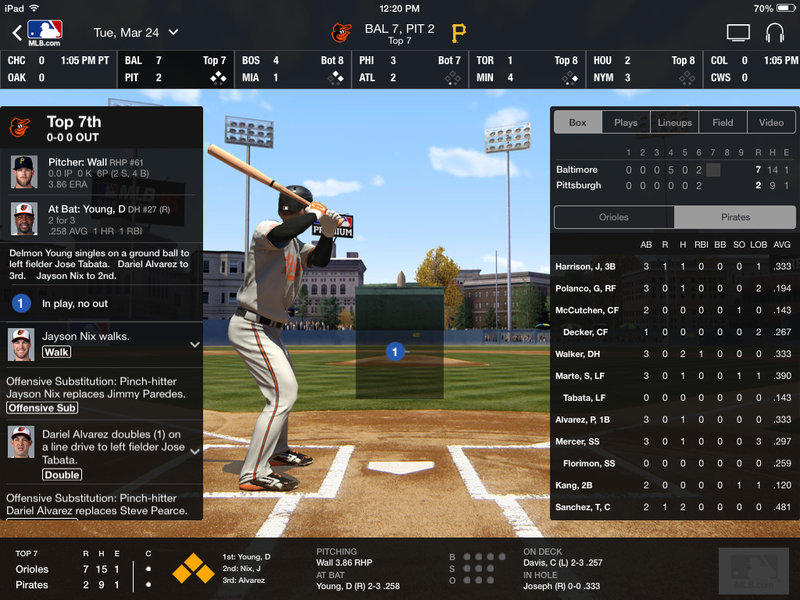 The app received several updates this season, including picture-in-picture streaming for live video and highlights and a split-view feature that lets you keep At Bat open while you multitask. iOS users can now use the app in both portrait and landscape mode. There have also been some design updates to Gameday, News Reader, Videos, and Sortable Stats. The Android version of At Bat gets a new UI experience for League and Team News readers (Android, iOS, Kindle Fire, and Fire Phone). There’s always important action in the minor leagues, too. MiLB First Pitch helps you keep track of it all. 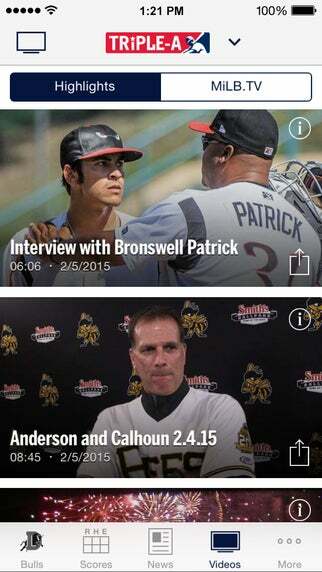 If you like keeping tabs on baseball’s prospects, download MiLB First Pitch. A companion to MLB At Bat, it provides similar coverage of 160 minor-league clubs with scores, stats, news, video highlights and push-notification game alerts. If you prefer your baseball coverage from a third-party source, it’s tough to beat ESPN’s free flagship app (formerly called Scorecenter). In addition to scores and standings, it will keep you supplied with a steady stream of injury reports, contract signings, and other breaking news from around the league. 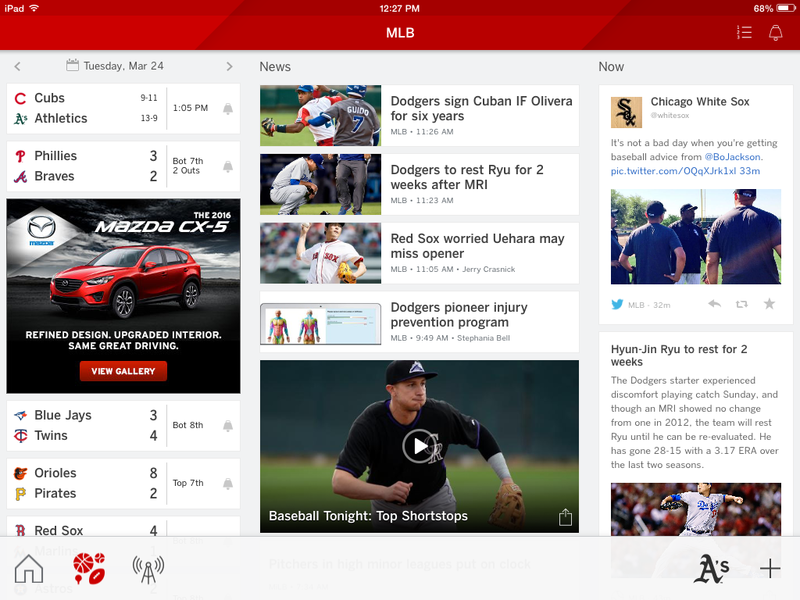 Swipe over to the ESPN Now tab for social media content from ESPN writers, teams, players, and other baseball insiders. ESPN has a great second-screen app that delivers breaking news, commentary, and injury reports in addition to scores and standings. And it’s free! Drafting a fantasy baseball team gives you a vested interest in the games and helps keep you engaged during a long season. ESPN’s Fantasy Baseball app gives armchair general managers everything they need to capture their league trophy. 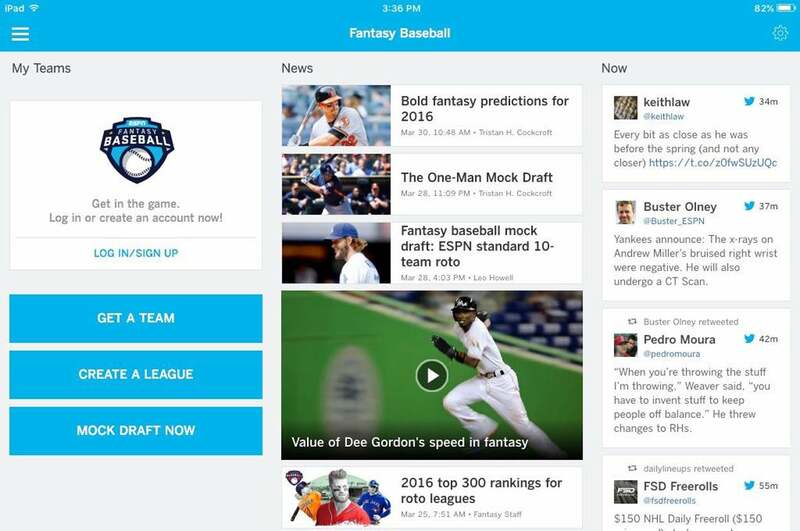 ESPN has another very good app that will help you dominate your fantasy baseball league. The app provides a full set of team-management tools: Set your starting roster; bench players; and add, drop, trade, and claim players off waivers, to improve your club. FantasyCast live scoring and stats keep you apprised of your players’ performance around the league regardless of which game you’re watching. And with video, fantasy news, and tweets from ESPN’s fantasy analysts, it’s like having an army of scouts at your fingertips. Scoring a game by hand is a tradition that goes back to the earliest days of baseball; but in our digital age, this pen-and-paper activity could easily go the way of flannel uniforms and Pullman cars. 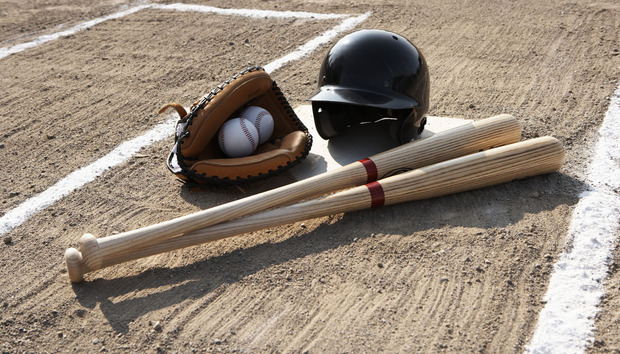 iScore Baseball, available for Android and iOS, can create a traditional scoresheet without requiring you to know how to the details of scorekeeping. Thankfully, there’s iScore Baseball. This app turns your device into a digital scorebook, but you don’t have to know any of the arcana of scorekeeping to use it. iScore employs interview prompts to help you track the on-field action. Say the batter grounds out to first base: To record that play, tap the Out button and iScore will ask what kind of out was made. Select Ground Out and the app will ask you to tap on the diamond where the ball was hit and the position that made the out. As you record each play in this manner, iScore translates it all into scorebook speak. After the game, you can generate or email a completed scoresheet, box score, or team stats. Like most fans, it’s your own rooting interests rather than the league at large that keeps you glued to the screen for six months every year. Bleacher Report understands this and lets you customize your second-screen experience with Team Stream. The fantasy baseball app Owners Box is the perfect companion to every season of the real thing. If you’re a fantasy baseball team owner, you have an additional stake in the season. The free OwnersBox app is your own personal scout, keeping you apprised of what all your fantasy players are doing while you’re tuned into the real games. You can track individual players or whole teams in real time, with enough stats to make a sabermetrician swoon. 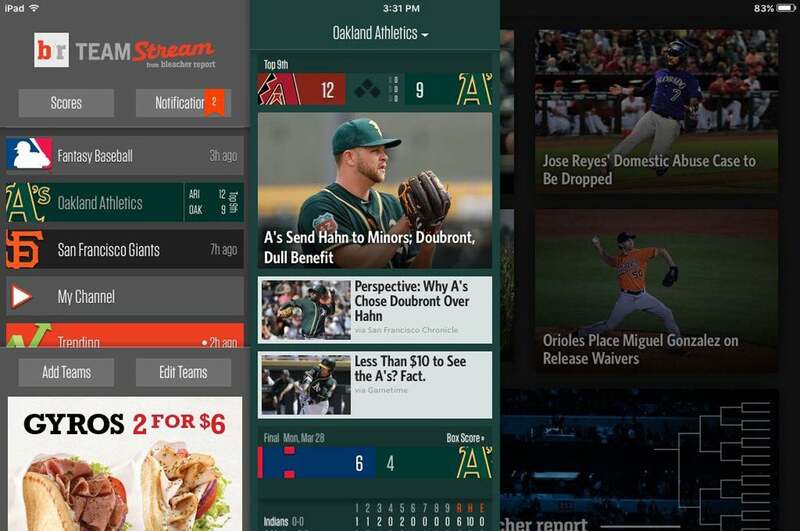 Okay, those are our picks for the best second-screen apps for baseball. What do you think, did we hit a grand slam or fly out to left field? 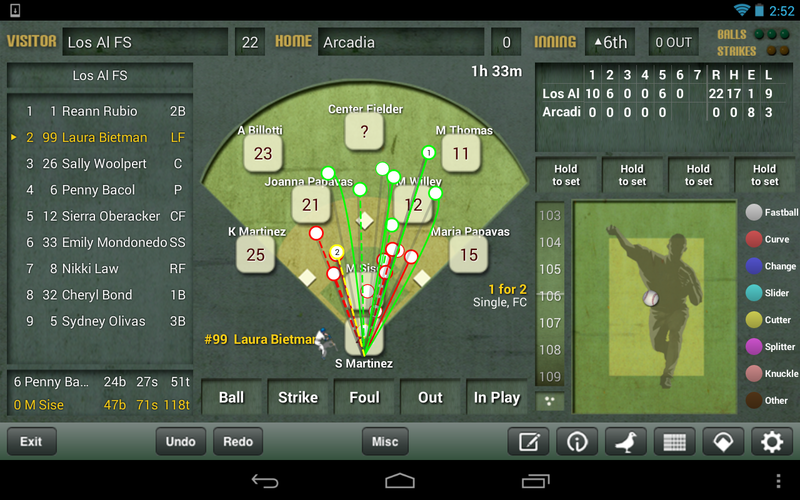 What are your favorite second-screen baseball apps? Let us know in the comments field, below!